Yahoo and Google will make a joint announcement at 1:30 California time this afternoon, we’ve heard from a reliable source close to one of the companies. What is the announcement? The very likely answer is, a search partnership between the two companies that outsources all or part of Yahoo search marketing, and possibly search itself, to Google . The two companies announced they’d test a search partnership in April. The controversial deal got the attention of Congress and others, but preliminary tests of the partnership were reported as positive. We’ve argued that a competitive search market is needed for a healthy Internet. Update: everything I’m hearing says that the companies will be announcing a search partnership of some sort at 1:30. Since we’re talking about public companies here, I want to stress that this has not been confirmed by either Yahoo or Google at this point. Update 2: Another source is saying that Yahoo will also announce the departure of another executive at 1:30 this afternoon. We don’t know who it is, but we’re hearing that it is NOT an announcement around Jeff Weiner’s departure. 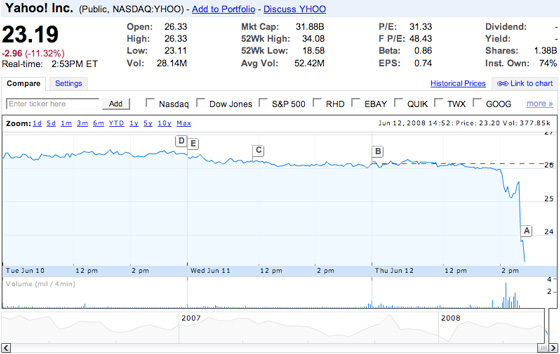 Update 3: Yahoo’s stock is down sharply based on this story and a follow up by Reuters, and what looks to be the final collapse of talks with Microsoft. Update 4: We are still waiting for the announcement. Update 5: (3:16 PM) The announcement has been made. Details here, as well as our analysis and notes from the related conference call.